California Family Attorney John Griffith began working with search engine optimization firm Millionairium 7 years ago. With his rankings struggling, Griffith returned to Millionairium after hiring and firing 3 other SEO companies. 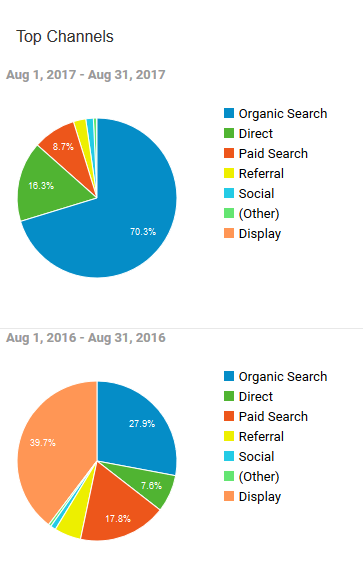 In the month of August alone, we managed to increase John’s organic traffic by 103%, and he contributes his “Booming Success” largely in part to Millionairium SEO. When California Family Attorney John Griffith opened his private practice seven years ago, he knew he would have to make a splash quickly if he wanted to make a name for himself. In an industry riddled with competition, he felt that digital marketing would bring him the rapid attention he needed to attract new clients. A quick Google search brought him into contact with our SEO firm, Millionairium. He stated that he was new in town and needed to surpass his competition in Google if he wanted to get the attention of local clients in need of a divorce or family attorney. Here are the results we were able to achieve for the legal practice of Griffith, Young, and Lass, serving the areas of Carlsbad and San Diego, California. 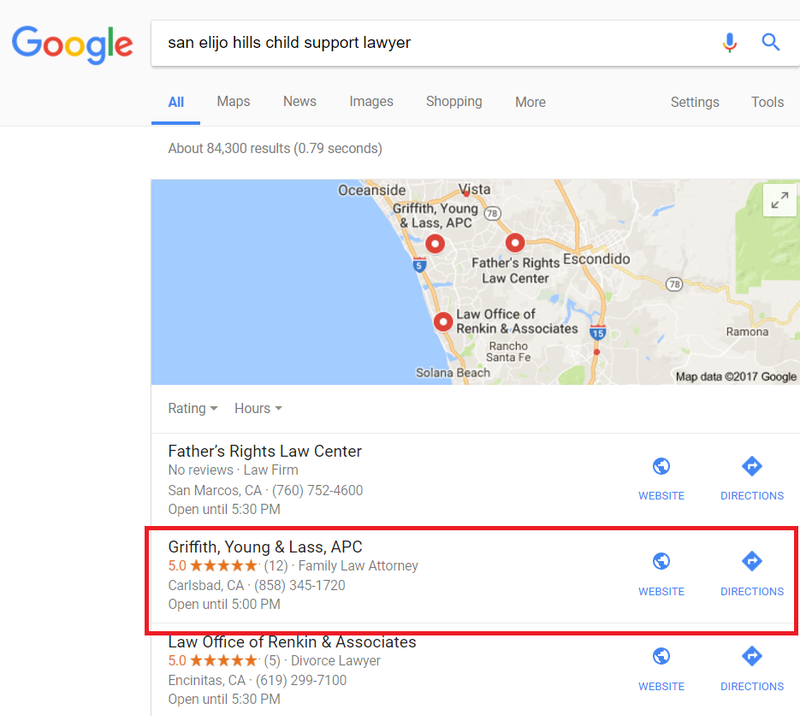 Since the GYL website was brand new, we knew that we had a major undertaking before us if we wanted to get the site to the first page of Google for each relevant keyword term, such as San Diego Family Attorney. The website of Griffith, Young, and Lass has received almost 6,000 organic Google visitors in less than a year, with 76% of those unique. 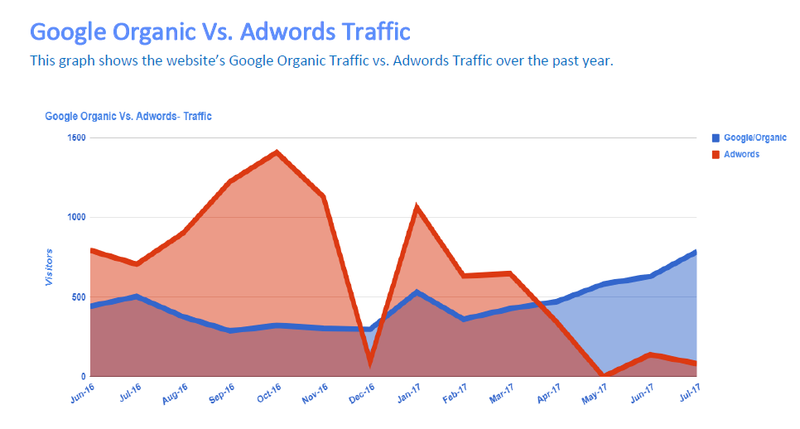 John uses Google Adwords, but organic accounts for nearly 50% of all Google traffic, and those results have been consistent over the past year. 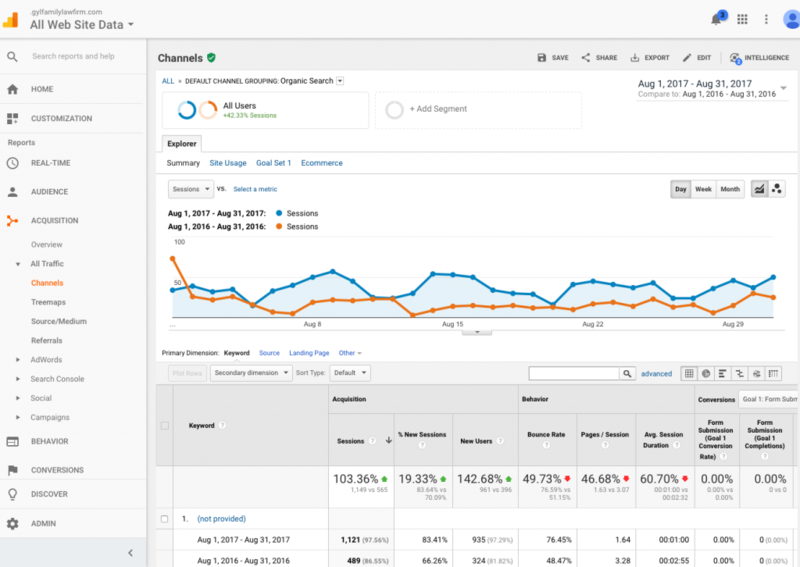 In the month of August alone, we increased John’s organic traffic by 103% when compared to data from last year, with 143% of those new users. 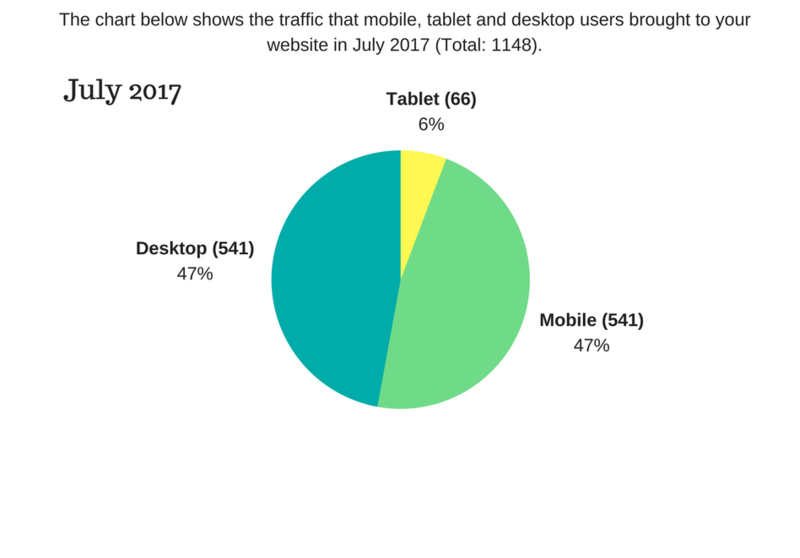 70% of all traffic is now coming from organic search (a major jump from 27% last year), and this has allowed John to reduce his budget on all other forms of online marketing. Thanks to our efforts, the GYL website now experiences an influx of mobile-using visitors. 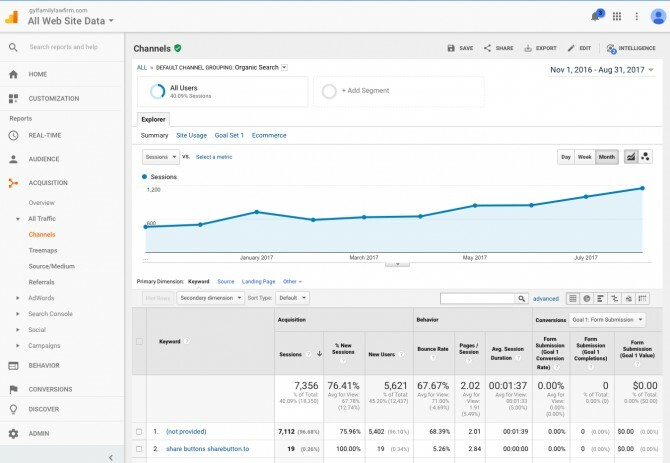 However, one of the biggest accomplishments of the SEO campaign was the fact that John was able to reduce his Adwords ad spend directly as a result from our organic SEO efforts. With more clients calling the office through Google’s organic search, paid advertising is no longer as necessary for lead generation. While these results represent the skill, experience, and attention-to-detail that we bring to every project we work with, John’s success did not come without a cost, and not just a monetary one. There was a difficult lesson learned, and it all started with a phone call to our offices back in 2011. When John told us how quickly he wanted to get to the top of Google, we understood completely. New attorneys don’t get a lot of referrals, after all. Determined to show him that we are different than every other SEO company out there. We gave him an offer he couldn’t refuse. We told John that we could get his keywords to the top of Google’s first page for his most relevant keywords or else we would give him a complete refund, no questions asked. John very candidly stated that he doubted our SEO methods in the very beginning. He felt he had learned enough about SEO to know that search engine optimization professionals are ubiquitous. He felt that any company with enough time and know-how could do what we can, and so his expectations were very low. John soon discovered that Millionairium SEO is indeed different than the rest. Within 4 to 5 months, the SEO campaign had already reached several of the benchmarks we established for the money-back guarantee. We managed to get several of GYL’s most important keywords on the first page of Google and – in turn – the office phone began to ring. A year into the campaign, John’s stellar rankings were holding, and John’s web traffic looked much like it does today. Then, something strange occurred, but not uncommon in the SEO industry. Griffith decided to end his relationship with us. The reason? He wanted to save money. Griffith felt that, since he had already achieved the high rankings he wanted, the hard work was already done. He figured he could dominate Google and save a few dollars by selecting a less expensive search engine optimization firm. John did find another company that began work on his website only for his rankings to begin falling. He subsequently fired the first company, then hired another, and then another. After a few years and thousands of dollars wasted, John found himself right back where he started. John has been back with us for a year, and the website of Griffith, Young, and Lass has returned to Google’s first page for many important keyword terms. The site also gets 189% more organic hits when compared to the previous year! What did John glean from this experience? 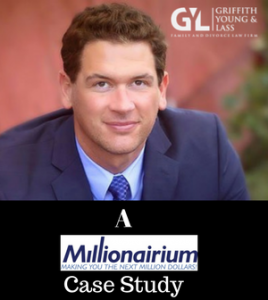 “Ali and Millionairium exceeded my expectations in the first few months. They are the best at SEO I have ever worked with. They are responsive, easy to work with, and they know SEO,” John said. John points to a few other areas where Millionairium has managed to remain heads and shoulders above the rest. Reduced Adwords Ad Spend: John was thrilled when he learned that Adwords paid advertising is no longer as necessary for driving interested clients to his legal practice. With the website getting so much organic attention, John is able to save money in the long run through his lowered advertising budget. For more information about Millionairium SEO, which can help you get to the top of Google for all of your relevant keyword terms, contact us at (310) 299-2799. Ask about our new Pay-Per-Lead system, an unheard-of offer in the search engine optimization industry! © 2017 Millionairium. Authorization to post is granted, with the stipulation that Millionairium is credited as sole source. Linking to other sites from this document is strictly prohibited, with the exception of herein imbedded links. I would love to know how you could help optimize my companies website. Hi Jordan. One of our reps will contact you on Monday.